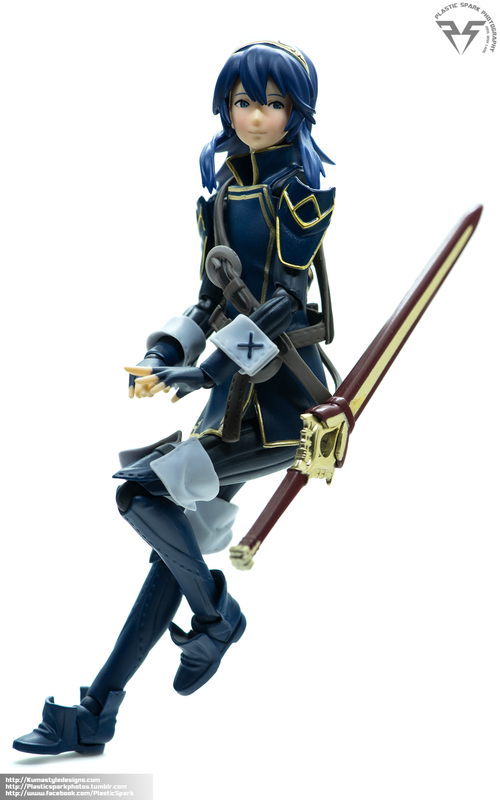 Lucina, The time travelling princess in disguise from Fire Emblem Awakening makes an appearance in the Figma line up! 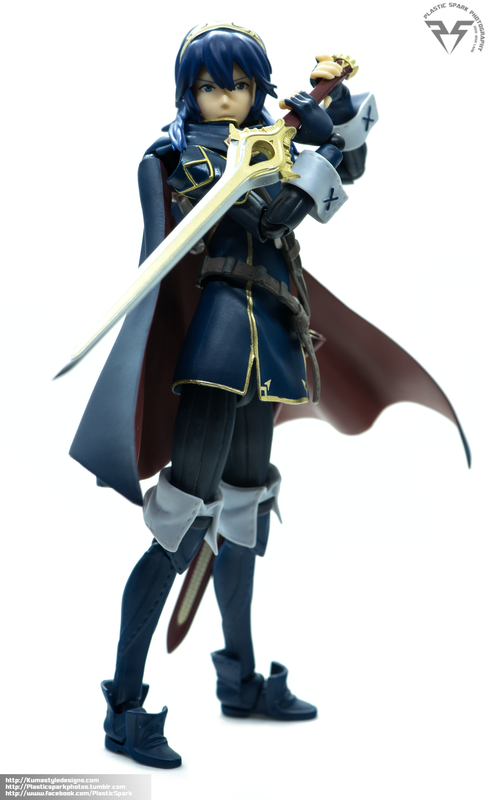 Lucina’s appearance in Fire Emblem Awakening has been faithfully recreated in this roughly 1/12 scale posable figure. The figure looks great, like she stepped out of my 3ds and on to my toy shelf. Every small detail has been added right down to the gold trim on her tunic and the oversized stitching on her white cuffs. One incredible choice was to make her belts a separate piece made of a very flexible rubber or plastic material. This adds a nice realistic look to the figure and helps it to stand out. This is a fantastic design choice, something I wish was implemented on characters with similar accessories like Figma Link. The sword scabbard is attached to the belt and while I would like it to be removable it doesn’t get in the way when posing her. Speaking of the small details, they even went as far as to put her mark of Naga in her left eye and the application is clean and crisp. Her boots can look a little bit awkward from some angles due to sacrifices made to enhance her stability but otherwise there really isn’t anything I don’t like about this figures appearance. She comes with 2 interchangeable faces, one stoic and fairly neutral, another that is more of a softer, gentler look with a slight smile. 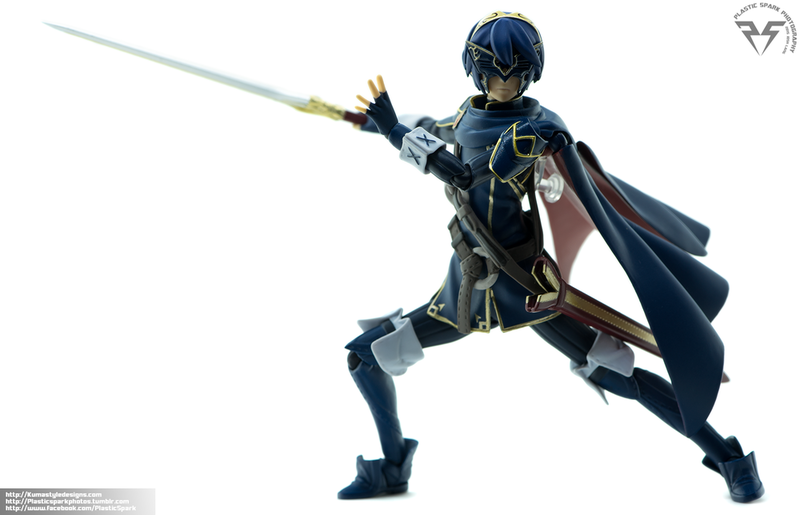 She also comes with a replacement piece for the rear of the head with shorter hair and a fringe with her butterfly face mask to allow her to be disguised as The Hero King Marth. (SPOILER ALERT I guess.) The hair pieces are interchangeable so you can have longer hair with the face mask, or shorter hair without the mask if you wish. Personally I think she looks cute with the short hair option even though it’s not an official look in the games. 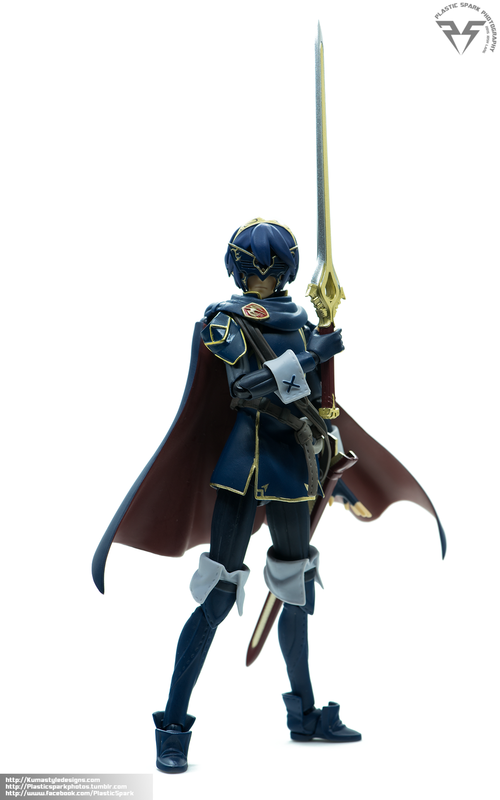 Lucina has the standard suite of articulation anyone familiar with the Figma brand has come to expect. 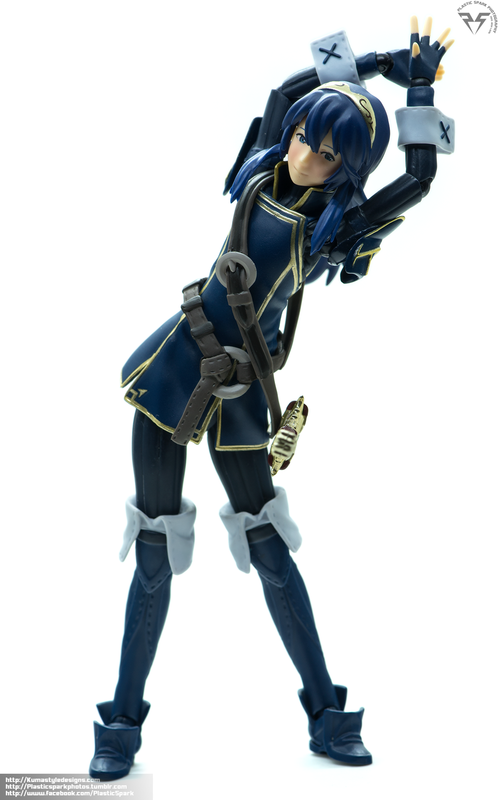 Deep single hinge elbows and knees with rotation, Ankle and wrist swivels and rotation, waist and ab articulation is there but some of it is hindered by Lucina’s tunic extending past her waist. Her shoulders can be slightly hindered by her shoulder armor, more so if the cape is equipped at the same time. The armor is pegged in to her shoulders so worst case scenario it will just fall off if obstructed. Her head and neck movement can be hindered by the static longer hair piece, and her cape but with the cape removed and the shorter hair equipped she has a full range of movement without any impediment. If you’re trying to pose this figure to photograph I think the only things that might cause you some stress are the cape pieces due to their heavy weight, trying to get them in to any sort of dynamic display option without the use of a stand can be difficult. 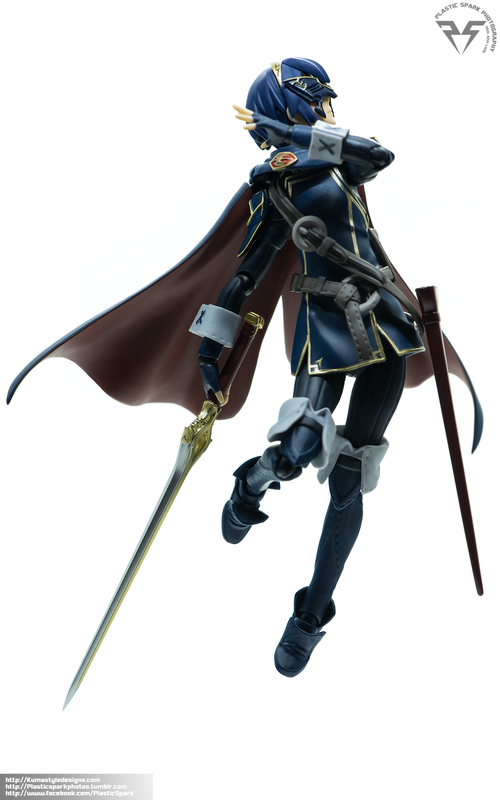 For accessories she comes with her sword, the Parallel Falchion, as well as a handle and hilt piece to click in to the top of the scabbard on her waist to display it sheathed. This is a nice alternative to actually sheathing the sword to prevent scratches or paint wear, though you lose the ability to show the sword being drawn or put away. That’s about it unless you consider hand options or hair as accessories. She’s a bit of a light release and I would have loved to see another of Fire Emblem’s many weapons, or even a couple more face options make it in to the final package. The lack of a fierce combat expression borders on criminal in my opinion.